How could I seriously forget how beautiful it is to sing in a choir? Last night was the first time I’ve sang in a choir for many, many years. I remember how much I loved it. Last night I joined my community’s community choir. It was wonderful. I must say, I’m a bit rusty and it’s taking me a bit to get my feet wet again, but after about an hour of rehearsal I was catching on. The phrase “if you don’t use it you lose it,” really rung true last night. But, I’m not sure you ever truly lose it altogether. Last night it all came flooding back after that first hour. At one point I just really tuned in. And it was beautiful. The sound of the harmonies and the voices reflecting off of each other rang in the room. There was a lot of talent in that room. It was absolutely amazing. There just aren’t words to describe the sound unless you’ve sat in a choir and sang in one. It’s such a moving experience. I still am amazed that I could forget that beauty. I’m excited about 2008. This is just one more thing I’m doing to make it a great year. I’m doing something I love. I’m waking up. And it feels great. For those who know me, the first concert is April 24. If you need more details, send me an email. It is so hard being a little three-pound poodle, especially when you think you’re as big as a pit bull. And I’ve realized, it’s scary being a “poodle mom” of a three-pound poodle. Owning a poodle this size comes with a lot of responsibility. 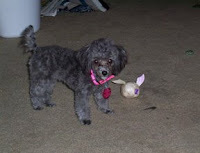 My Mayiah, my little poodle, thinks she’s big. No, correct me here, she KNOWS she’s big. But every once in a while she gets a reminder that she’s small. And she comes running screaming to her “mommy.” Last night was one of those nights. I was just home hanging out with my babies. Mayiah was rough-housing with the boys (two shih tzus). They were running around the room and Mayiah was doing her usual bumble bee routine. Her growl sounds like a small bee. The next thing I knew Mayiah was on the floor and Chewie jumped off the couch, landing right on her. Mayiah yelped and continued to cry all the way over to me. She jumped in my lap and when I touched her she cried even louder. Scared the crap out of me. She calmed down after a bit and I kept a close eye on her to make sure she hadn’t seriously hurt anything. She seemed fine all night. But me being the paranoid poodle mom, continued to peer in at her all night — just to make sure she was OK. It was just scary. And when my Mayiah comes running to me with her tail tucked between her legs, she’s been hurt. Because normally she’s a “tough dog” who beats the tar out of the boys. But that night, she was momma’s baby. In need of her poodle mom. Oh, the joys (and worries) of owning a small dog. I pulled up to my home and looked down the road. There among the snow that is still on the ground, the snow geese were landing for the night. They were circling the field and their brilliant white feathers were beautiful against the clear blue sky. Absolutely beautiful. I pulled my car up to the driveway and stopped. I wanted to watch. It was a perfect moment. A moment of beauty where everything else seemed to stop — if only a few minutes. The day’s frustrations melted into the background. I was stunned by the beauty of the snow geese. When I got out of my car to go into the house, something startled the large group of geese and they all took flight. The sound was near deafening. Another moment of beauty. I smiled as the geese again circled the field until they felt comfortable enough to land again. Their movements were precise — as if they had practiced synchronizing with each other. I love to watch geese fly. And yesterday, mine brought me down for a moment from another stressful day at the office. They sent me into the house with a smile and a bounce in my step. A natural stress release provided by mother nature. I was reminded again, that life isn’t about the office. It’s not about how much work I have to get done or how many stories are crossing my desk. It’s not about the ringing phones or the bills. Yes, those are a part of my life. But only a part. And when I succeed in actually practicing what I just wrote, I’m throwing a party! It’s time to get serious. See my serious dog?! Time to get serious about not being so serious. Yes, confusing. But it makes sense in my head. Sometimes I just don’t find life funny. Ok, so most of the time lately, I don’t find life funny. I walk around with a “no nonsense” attitude. A business attitude. A get things done and get right to the point attitude. Unfortunately, life isn’t like that. Life takes humor. Life takes laughter. Yeah, life does take seriousness too, but not to the point where you give yourself a headache. Last night I caught myself laughing at simple things. It felt good. I found it funnier than all get out that I could dance with my dog. Laugh if you want. It doesn’t bother me! Anybody who’s read my complete blog already knows I’m crazy when it comes to my animals. So yeah. Another goal for 2008 is to laugh more. Be less serious. Wear a smile more. I caught myself fuming at work this morning when I had to adjust my schedule because of an unexpected story. It’s my job. Life is unpredictable. Especially in the journalism field. I quickly adjusted my attitude. So what if I had to adjust my schedule? It’s not the worst thing that can happen. I learned how to play a glass last night. I was washing a glass — one of those really nice looking glasses similar to a cocktail glass. I wanted to put my ginger ale into something special. IDK. It just made me feel better I guess. I once read an email that said why wait to get out the special dishes? Every day is special. Yes, I’m a definite nerd. And I think it was a bit confusing to my friends who were in the other room as to why I was standing washing a glass and making it sing. The dogs kept looking at me funny too. I dunno. It was just fun. Just one of those moments where you take a break from deadlines. You take a break from the phone. Take a break from life. And discover that you have a utterly useless, but fun talent! So we’re 10 days into 2008. And I can say it’s already had its rough spots. And I haven’t blogged much. I’d like to change that. I went into 2008 largely without New Year’s Resolutions this year. Minus the one that Kat claims I made to reduce the word “effing” in my vocabulary. Hey, I read that word in the last Harry Potter book. So I don’t quite feel so bad saying it. Except I don’t say it in certain company. That should tell me something. Back to my resolutions. I didn’t really have any this year. Oh sure, there was the thought of getting myself straight financially. Getting fit. Yada yada yada. How original, you know? Those are probably the top two. So I got frustrated and didn’t make any really. But, in the last 10 days of 2008, some have developed. Some I’ll share here. Some I won’t. Oh, and I have a new hero this year! Mary J. Blige. Her music has inspired me to write much of what I’m about to write. Her songs inspire me. Two songs in particular “No More Drama” and “I’m Just Fine.” Those are my life songs right now! • Listen more. There’s a whole world around me. People. Flowers. Animals. Life!! • Talk more. Nobody can read my mind. But they certainty read silence any way they want. And I’m usually not going to like what they come up with. People assume all kinds of things when they don’t have information. Sad, but true. • I’ll call my mom more. Seriously, I miss my mom. A lot. We text every now and then, but that’s no substitute for talking. Real-time talking. PICKING UP THE PHONE. What a concept. Yes, I will call my mom more. • Set small-term goals for myself. And stick to them. I have a couple of milestones coming up. Yay me! • Laugh. I sometimes get caught up in the seriousness of life, when laughter will fix a lot. Or will at least lighten a situation. I’m not talking about busting out laughing during a tragic situation. I’m talking about finding laughter in everyday life. • Each day, I’ll write a few things down that went RIGHT. As an person who religiously journals every day, I realized in 2007 how much time I spent on the negative. This is so non-productive. Sure, it was a part of the day. But it doesn’t have to be the whole day. Heck, I’ll even draw myself a picture of the day’s successes. • I’ll make a honest crack at procrastination. It’s something I don’t like to admit, but I do procrastinate. I will take action. Instead of taking the Scarlett O’Hara attitude “I’ll think about that tomorrow.” Well, for me tomorrow turns into next week. And next month. Yeah, that has to stop. • Perfectionism. Um, this one is dependent on what it is. When I look at my bathroom sink and it’s full of hair and toothpaste, I kinda lose it. I don’t see how somebody can deal with that. Yuck! And the sink usually leads me to scrubbing everything else in the bathroom. And then out into the front room…yeah…so I guess it depends on what it is. But I’m not lowering certain standards at how long I’ll look at hair in my sink. • I’ll eat my vegetables. No really. I will. I’m sure there are more. More will be added. These are just ones that I’ve thought of in 10 short days. The first 10 days of 2008. The year 2007 had it’s challenges. This year, there is to be NO MORE DRAMA. I can’t predict if there will be tragedy or pain. But I can say that the drama is over. Here’s to a wonderful year. A year minus all the drama. Drama is for television. And even for other people probably, but it’s not for my life. Not anymore. So, welcome 2008. Welcome to life. Welcome to love, joy. Good stuff and bad. It’s been a whirlwind week already. A reminder to anyone who needs this tonight: it’s okay to take a break. Look at the sky, listen to the birds, listen to music. Take some time for you. You got this, everyone. Keep going.